Going into ‘How to Train your Dragon 2’ I was nervous. The bar had been set so high by the first film, and the first trailer that came out had such a massive spoiler that I refused to watch any more trailers until I saw the movie. It turned out to be rather difficult to avoid the barrage of marketing, but I did the best I could. This Father’s day we finally went; my wife, six year old son, my four year old daughter and I. Now let me stop here and make sure everyone knows that this movie is rated PG, and for a good reason. I have many good things to say about this movie, but had I known how emotional and intense it was I would not have taken my four year old! More on that later. Seriously parents, if you have preschoolers, or even sensitive children, look into the movie (or read the rest of this review). You may want to wait to watch it, or at least prepare them somehow. Despite being emotional enough to almost make me cry (not to mention my poor daughter), I really enjoyed the movie. As much as any sequel, it lived up to its predecessor in its meaningful plot centered on relationships, discovering who you are, and growing up. Near the end the action may have gotten in the way of those points a smidge, but then, I needed the emotional break by that point. My two favorite things about the first movie were the dragons, and the rare and touching father-son dynamic that played out. HTTYD2 focused hard on these two aspects and I think that that is why I liked it so much. The sequel introduced multiple new dragons, and each was interesting and colorful. I will admit that I never cared for the protruding bug-eyes most of the dragon have (the biologist in my cringes), but I can forgive that since I have seen that it stems from the drawing style of the original concept art. The Bewilderbeast was an impressive addition, I loved the tusks and the ice breath, but something about the flat face, and in particular the small teeth didn’t sit quite right with me. Toothless’s changes were a nice touch that brought you back to the wonder of the first movie when we first met the impressive black creature. Although, (yes I’m being picky) how could the dragon not have known that his dorsal spikes could split and flap? Even still, the glowing blue bit at the end made up for that lapse rationale. One last complaint about the dragons and I’ll be done, and this is a big spoiler. At the end Hiccup helps Toothless resist the control of the Alpha by blindfolding him. How did Hiccup know that the Alpha’s control worked through the eyes? Several times actually, the Alpha controlled dragons from some distance without being able to see them… A weak plot detail if you ask me. On to the relationships. Seeing the family relationships and the bonds between Hiccup, Stoic, and Valka was beautiful. The relational plot centered around Hiccup’s anxiety over what kind of a man he is, and how he can take on the role of village chief. In meeting his mother, he discovers that his unique traits come from her, and he finds peace in who he is. Unfortunately, still being naive, he relies on his own skills instead of listening to wisdom and putting his tribe first. That’s right, I said it. Stoic dies. And not just a falls into an abyss and disappears forever kind of dies. In an emotionally charged, heart wrenching twist, Stoic is killed by a dragon blast as he takes the blow to save Hiccup’s life. Not only do we pretty much see it happen, we get to see Hiccup and his Mom cry over his dead body at some length, and then a very solemn Viking funeral. My eyes teared up, I’ll admit it. But my four year old was bawling. It is not the kind of character death that will go over the head of a small child. Dreamworks makes sure of that. Did I mention it was Father’s Day? That’s right, on Father’s Day, I took my kids to see a movie where the main character’s father dies horribly. Epic parenting fail. Of course, Stoic’s sacrifice inspires Hiccup to fulfill the role of Chief of Burke and defend his home from an evil dragon army. One of the interesting themes in the movie was whether or not people can change. Hiccup’s mother did not return to Burke because she believed Stoic and the others could not change their dragon killing ways. She was proved wrong, by Hiccup’s taming of Toothless in the first movie. We also see the dragon trapper, Eret son of Eret, change his ways. Interestingly, we get a little reality check in that, despite Hiccups confidence and best attempts, the scarred villain Drago Bludvist remains unchangeable. Life is hard, there is hope, but you can’t change some people. Too true. They tried to make a point in the movie about leading by free will, but it didn’t really work for me. The scene where Drago shows his dragon dominating skills was impressive and resonated, but the antiparallel didn’t hit home to me. I can’t even pin down when it was supposed to be shown. Maybe I was distracted by my daughter crying. I have a few minor pet peeves left including; 1) the rather limited role of Astrid in the film, 2) how in Thor’s name did Drago tame/subdue the Bewilderbeast in the first place?, and 3) why were all the baby dragons the same species? Those issues bothered me a little, but not so much that I won’t see it again. Despite all that, I really enjoyed the movie, at least I did when I wasn’t feeling like a jerk of a father. I can’t wait to see it again when it comes out on DVD. Check out How to Train Your Dragon 2. I give it 4 out of 5 impossible flaming swords. Be ready for a wild ride, but leave your preschoolers home. 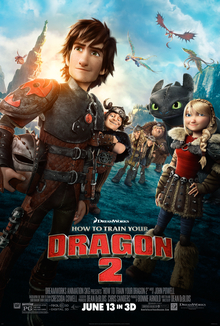 Check out my Review of How to Train Your Dragon 2! That said, Stoic’s death was…well, I really wasn’t expecting to that in a kids’ movie, to be honest. I more-or-less assumed he was going to die as soon as I saw the PG rating (killing Hiccup or Toothless would have ended the franchise, after all), but the manner of the death surprised me a lot. I can’t help but wonder what the third movie will pull, after that.